Italian Prime Minister Romano Prodi has been criticised for the way his government has negotiated the release of Italians kidnapped in Afghanistan. 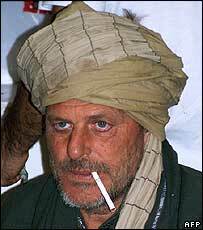 Three weeks ago an Italian journalist Daniele Mastrogiacomo was freed in a prisoner swap with the Taleban. Now it is alleged that last year the Italian government paid $2m to the group for the release of another Italian, a photographer. 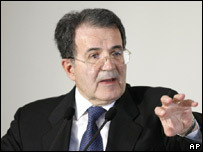 Romano Prodi has not denied the claims but rejected opposition criticism. When Daniele Mastrogiacomo was released on 19 March, he returned to Italy to a hero's welcome. But at what price? Many believe the deal in which five Taleban prisoners were released in exchange for the journalists freedom created a dangerous precedent, putting all international journalists and aid workers in Afghanistan at risk. This weekend, the perils of negotiating with the Taleban became all too clear: first, the news that Daniele's Mastrogiacomo's translator, 23-year-old Afghan Ajmal Naqshbandi, had been beheaded. He was supposed to have been released along with the journalist, but the Taleban held on to him to try and extract more: and maybe there is a very good reason why the group had grown so confident. The charity who negotiated Daniele Mastrogiacomo's freedom, the aid group Emergency, has alleged that last year their negotiator was entrusted with $2m to take to the Taleban to bring back another Italian, the photographer Gabrielle Torsello. Prime Minister Romano Prodi, who has tried to distance his government from the deal that was done, has not denied the claims. He says all negotiations were carried out to ensure the safe return of Italians and according to procedures put in place by the previous centre-right government of Silvio Berlusconi. Mr Prodi's centre-left coalition barely survived on 27 March a vote in the Senate on the funding of the Italian military contingent in Afghanistan. Romano Prodi had already resigned in February over the Afghanistan issue, before being reinstated, following a confidence vote in both parliamentary chambers.